DJI’s drone cameras have come back down to earth, and have been transformed into a unique and powerful tool for stabilized handheld video. The Chinese company today announced Osmo, a new twist on the action camera that has tremendous potential not only for consumer-level videography, but for filmmakers as well. 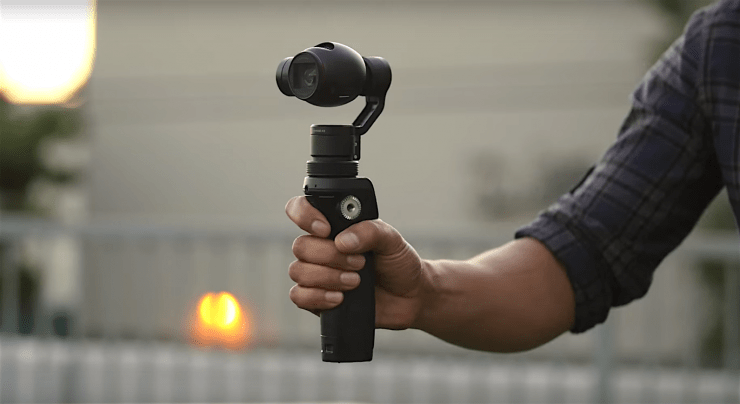 Sporting a simple pistol grip and one of DJI’s Zenmuse 3-axis gimbal stabilizers, the Osmo brings highly-stabilized 4K video and 120fps HD video right to your hands. The device also offers hyperlapse and timelapse functionality, as well as panoramic shooting. First up, here are the two introductory videos for the DJI Osmo. The Osmo appears to be using the same 4K camera — or at least one that is very similar — to the camera that is included with the Phantom 3 Professional. The main difference between the two is that the camera on the Osmo is capable of 120fps in full HD, whereas the Phantom 3 Professional camera tops out at 60fps. Like the rest of DJI’s cameras, the Osmo needs to be used with a smartphone in order to monitor your footage and change most of the internal settings on the camera. With that said, the pistol grip has some basic functionality built into it, like a record button, joystick for controlling the gimbal manually, and a toggle switch to change the mode in which the gimbal is operating.